Childhood is magical. I watch my boys look at the world with wonder and excitement. There is such joy in their eyes at the simplest discoveries. 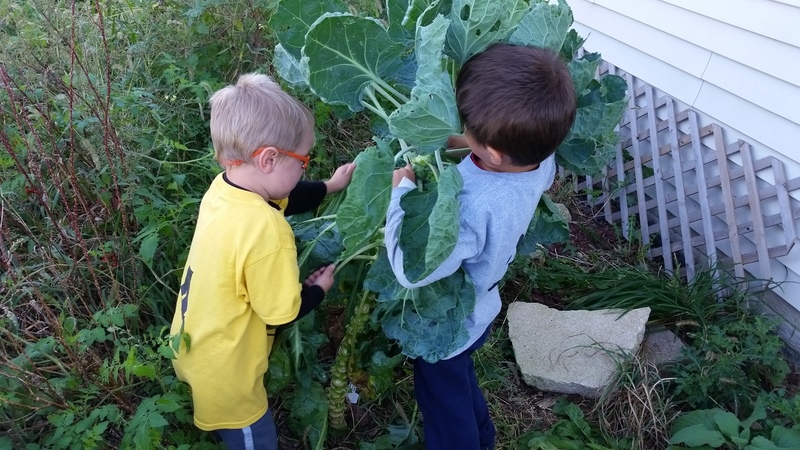 For them, finding a caterpillar is the most exciting thing in the world and learning a new song is the most thrilling accomplishment. The world is full of wonders for them. They are invincible. Nothing can stop them. As we grow to adulthood, we wonder where it went….that intangible something that made childhood so special. That magical ‘thing’ is the imagination without boundaries. Specificity, when taken too far, stifles creativity, kills the imagination and takes all the fun out of learning. When we decided to homeschool, I wanted to get the right curriculum and follow all the rules. I wanted to have specific instructions on how to teach each grade. In Kindergarten, the boys would master x, y and z. In first grade they would learn a, b and c. I was determined to get on the right path and make sure the boys kept up with everyone else their age. As you’ve guessed and I’ve confessed, that plan did not last long. In fact, it bombed and, instead of being excited and hopeful, I felt frustrated, worried and tearful. Our journey through education changes constantly. My plans for the day, more often than not, get derailed. We improvise and switch directions on the fly. When the boys aren’t interested in the way I’m teaching the day’s lesson, I do not push them to do it that way. I’ve made that mistake. It ended with all of us angry, in tears and extremely frustrated with each other. Instead, I try to keep the instructions minimal. I don’t give specifics unless requested. We learn quite a bit through games, activities and songs, so I found a sight word activity on Pinterest. 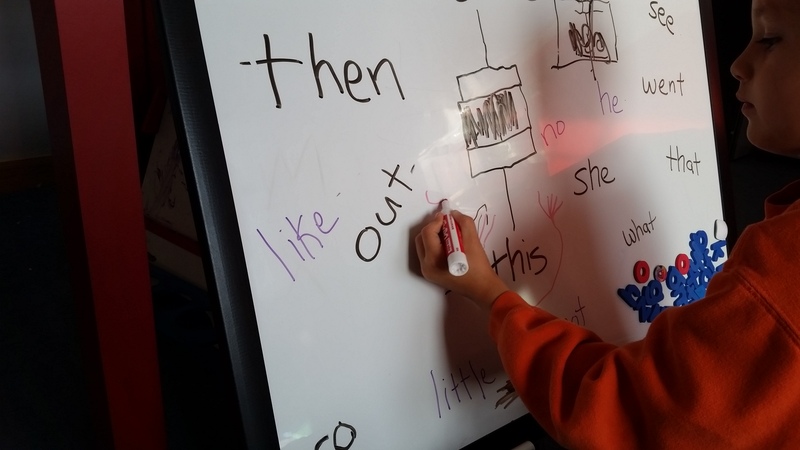 Draw a sight word card. Find it on the whiteboard and put an ‘X’ through it. I explained the steps to Joe, but he had other ideas. Rather than read the card first, he drew an arrow to a word and said it out loud. 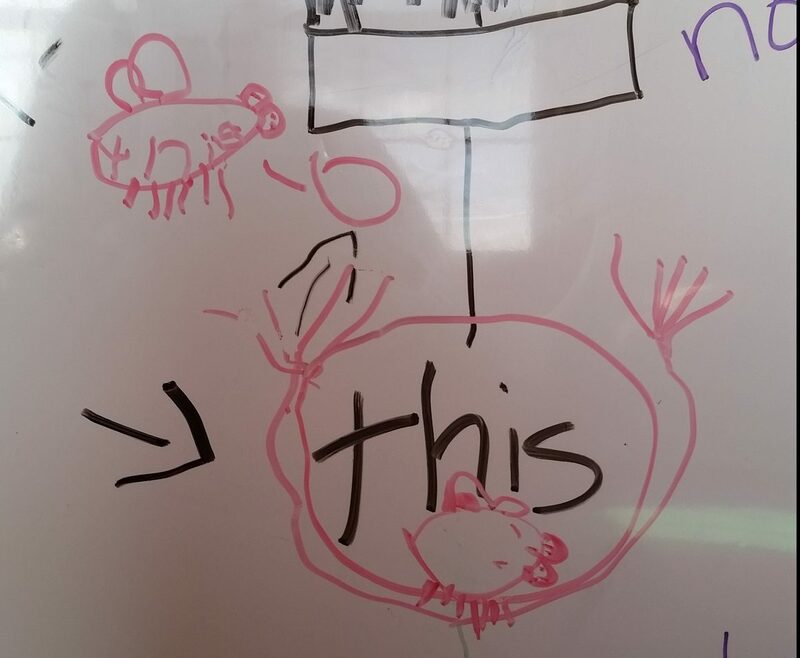 Rather than draw an ‘X’ through the word, he drew monsters or smashers to chomp the words. The part of me that learned to follow directions, stay inside the lines, do things the right way…shuddered. My instinct was to redirect him to follow the instructions I’d given. I ruthlessly squashed that instinct. He had found his own, creative way to learn. 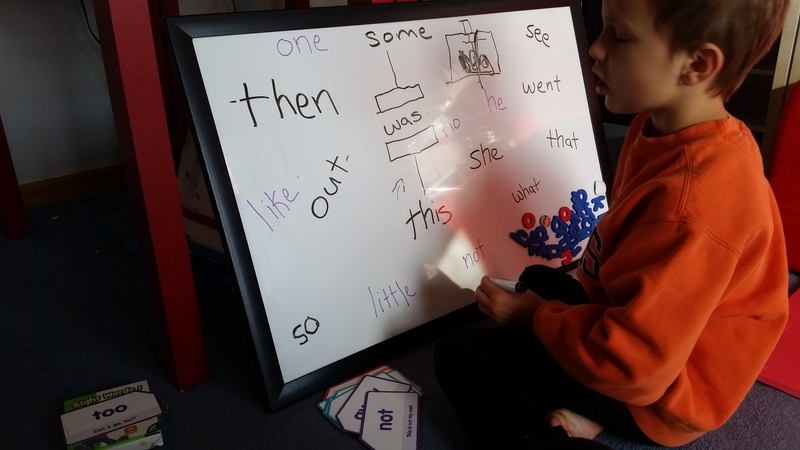 He had made it a completely different game with different rules, but with the same end: learning sight words. I’m not saying that specificity has no place in learning…of course it does. But, had I been unwilling to let Joe bend the rules to fit the way he wanted to learn, I never have witnessed his imagination at work. I never would have seen him draw sight word smashing machines and make sound effects while scribbling the words out. I never would have seen him draw a venus fly trap to chomp the “this fly”. And that would have been a true loss. Specificity has its place, but we should be very careful when using it.